Dropbox isn’t available in the Amazon App store. 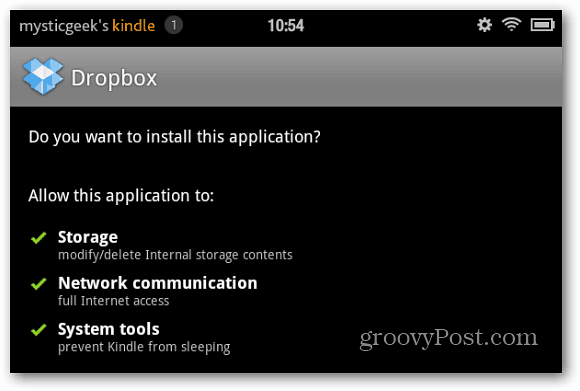 But you can install Dropbox on the Kindle Fire without rooting it. Here’s how! Dropbox isn’t available in the Amazon App store. You’ll need to make a couple of adjustments to your Kindle Fire to to install it. You don’t need to root your device to install it. First tap gear icon at the top of your Fire then select More. Next, select Device from the Settings menu. Set Allow Installation of Applications to On. 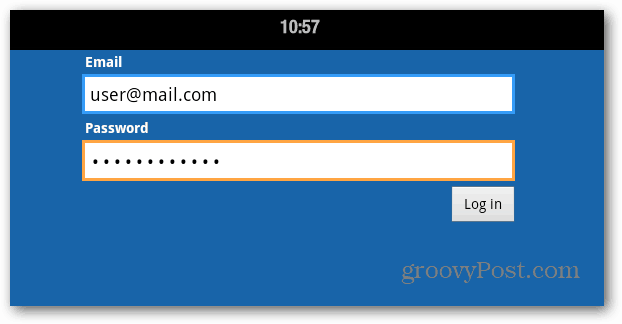 Now, launch the web browser and type: https://www.dropbox.com/android into the address bar. Then tap Download App. Give a few seconds to download then tap the notifications next to your Kindle Fire’s name. Then tap the Dropbox.apk. You’ll see a description of the Dropbox app. At the bottom the the description screen tap Install. After Dropbox installs, tap Open at the bottom of the screen. Tap through the Dropbox tour screens, the log into your Dropbox account. Now you have access to all of the files stored in your Dropbox. You can upload, share and manage files in your Dropbox account just like you can from any other device or computer you have Dropbox installed. 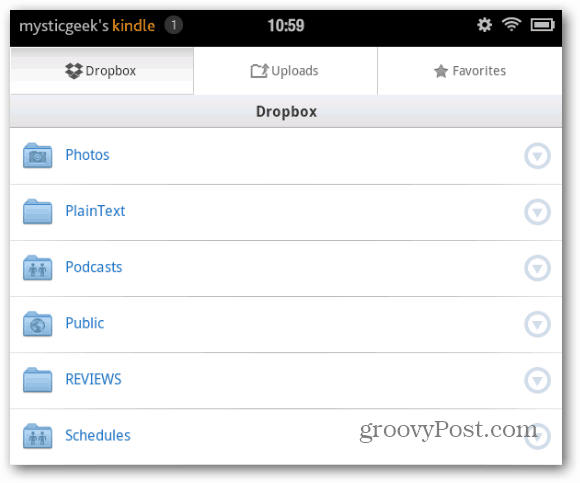 The Dropbox icon will show up when you go to the Apps section on your Kindle Fire. If you want quick and easy access to it, pin it to Favorites. Just a heads up, if you’ve set your Fire’s browser to ‘optimize for mobile view’ clicking the download link for the dropbox apk will try to take you to the Amazon app store where the Dropbox app is not available. Switching to desktop view will let you download the apk file directly. I bet this would also affect download links for other apps as well. Thanks Ricky, you solved it for me. By the way, fun fact, you can sync Dropbox with QuickOffice app.. the gymnastics required (email yourself!) etc is a lil silly though. Big Thanks. Saved my day! 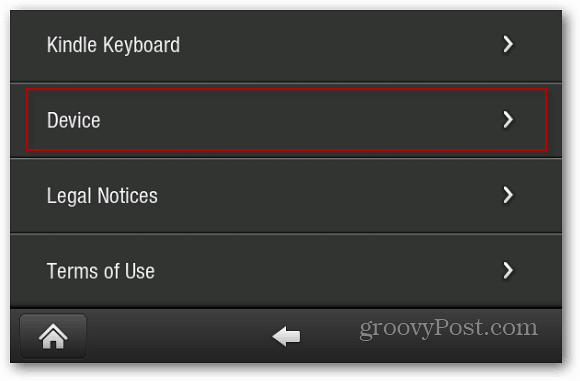 We love saving days so thank you for the feedback and welcome to gPost! Thanks for the easy, how to? You bet AlanG! Glad it worked out for you! This worked great on 5/5/12 – thank you, but to access the files from dropbox, I still have to have the wifi connection on, otherwise I get “network error – please try again later.” Doesn’t that defeat the purpose of having an app instead of accessing via web? Did I do something wrong? Also, after I install dropbox, can I turn the “Allow installation of applications” back to off position, or will that preclude making updates to dropbox? Looks like as of the latest update you can’t download the apk with the fire. I tried silk and Dolphin. With all the settings correct, but Amazon blocks it anyway. However, transferring the file from the desktop worked fine. I just discovered DropBox last week and have put many of my ukulele chord sheets in a folder on it. I then decided that it would be cool to have all my chord sheets on my Kindle Fire. I bought MobileSheets, but I haven’t been able to figure out how to import the pdf files… until I installed the DropBox app on my Kindle. Thanks to you, the install went EXACTLY as you described. From my Kindle, I accessed my DropBox folder and selected a sheet. The app asked me if I wanted to complete action using Adobe Reader, Amazon Kindle, or Import into MobileSheets. When I chose MobileSheets, it did what I wan’t able to do–install the individual chord sheets into MobileSheets. I can now carry around my Kindle Fire with all my songbooks. No more lugging for me. Many, many thanks to you. You are very welcome. 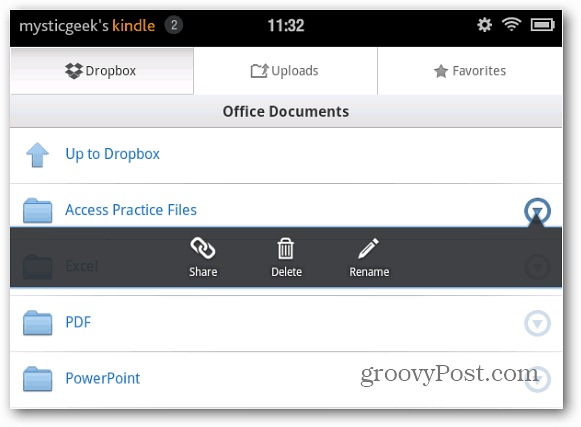 Welcome to groovypost and Dropbox! We have a million Dropbox articles so take a look there as you become more familiar with it. Not a problem. We aim to please. Thanks so much for the great instructions! I just installed Dropbox on the Kindle Fire HD too. The process is essentially the same. 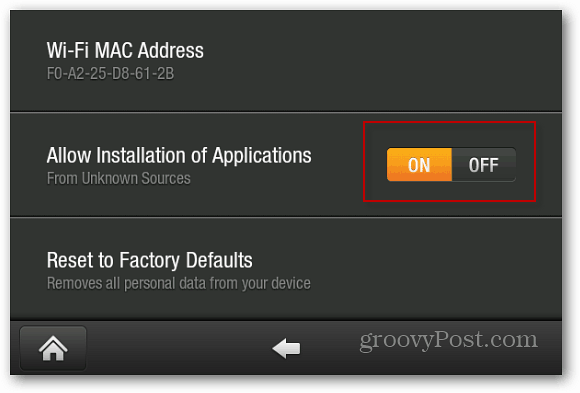 Go to Device Settings and turn on the option that says “Allow Installation of Applications. Then go to the same Dropbox link: https://www.dropbox.com/android and download it. After it downloads, swipe from the top of the screen down to display Notifications and tap the Dropbox.apk and it will install successfully. Thanks1 Excellent advice. Worked like a charm! Thanks, Brian! I can’t believe the details on the Dropbox site STOP after “Download”. Since this was my first non-Amazon app, I had NO idea how to proceed. (Now, I know what the little number beside my name is! I don’t usually click or tap on random things. LOL) I’ve added this post to my Evernote so that I can share it with other users. Thanks Brian, great easy to follow instruction. Thanks for the dropbox installation guide. Works great so far. I will try it at a Starbucks. You are the greatest!! Tried all that out, but my Kindle Fire kept trying to send me through the Amazon store. In the end I downloaded the ‘Dropbox.apk’ file and posted it zipped to my email account. I then downloaded and installed it from there. Worked a treat. Thank you. My Kindle Fire is more productive now. These directions were amazing! Perfect and easy for a non-computer literate person. I’ve followed the directions exactly and I’m not getting much success with my fire hd. After turning on to allow apps to download, I go the website and click download dropbox. It says starting download for a second and after about a minute it says download complete in the middle of the screen but I don’t get anything in my notifications. If it’s actually downloaded, then where is it or is not really working. It’s not in where my apps are stored. I hope someone can help. Thank you in advance. THE 3 BAR DOODAR…luv it!!! This option for downloading dropbox on the new kindle fire 7″ 5th generation is now different (not hd or hdx). as i have not used either of the better models. 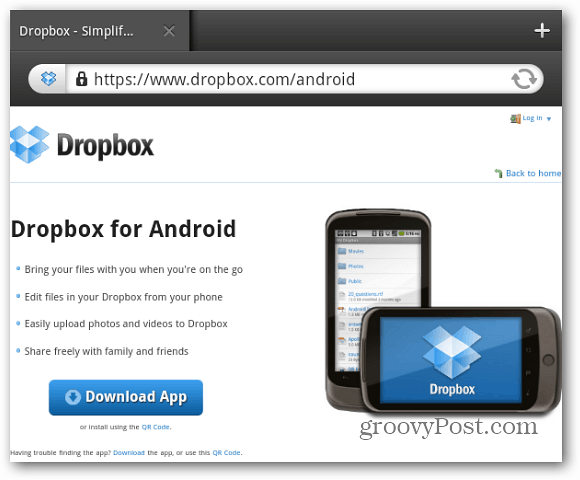 go to http://www.dropbox.com/android – download the Android app. 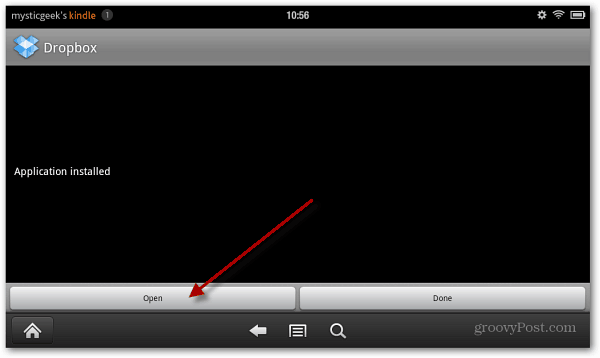 then select install on you application tabs from the top/drop bar menu on your kindle fire. thought this may help people who had a little trouble doing it, like me. I now use OneDrive so pointless for me but good to know how to use this with other applications that aren’t supported by the amazon app shop. I own a first generation kindle fire. I tried your steps to install drop box. I don’t get my kindle to respond when I press the download button. According to your time stamps on your instructions the kindle displayed looks as if it took 50 minutes to download. Am I being impatient here and should wait? I’m pretty sure this doesn’t work anymore. I (and others in various forums) can’t get any APK files such as Dropbox to install on the first gen Kindle Fire any longer. (“Parsing error” results.) They’re not compatible with the old Android 2.3 and need the new Android 4+. And if you do manage to update your Android OS in ROM, your Kindle’s no good anymore as an Amazon e-reader. So it’s dawned on me that those of us who were loyal first-gen Amazon customers are screwed.